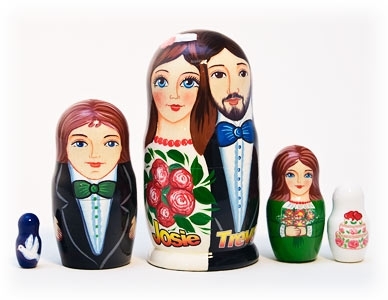 Custom Russian Nesting Dolls: Let Our Artists Create a Doll for You! Let Golden Cockerel create a fun family nesting doll of your loved ones; it will be a conversation piece and most surprising nesting doll gift. Send us your favorite photos and our artists will transpose them onto a custom Russian nesting doll for you. There is room for you whole family on our custom matryoshkas—even the beloved family pet! To customize further, have us add a fancy frame or a special message with a text banner. We aim to please! For more information on Custom Photo Dolls, click here. Did your camera fall into the Volga River during your big trip to Russia? Don’t worry! We can create a custom Fantasy Vacation Russian Matryoshka by inserting your family into the background of your choice. Just send us your family photos and we will recreate those special moments in front of Russia’s famous landmarks. Just let us know what the destination is and we will create a custom matryoshka for you! Have us make a special gift featuring your favorite vacation, or the vacation you’ve always dreamed of. Call us for a quote! One of our customers chose to commission a matryoshka urn to hold the ashes of his beloved Russian wife, Connie, a longtime lover of Russian nesting dolls. We custom carved a huge Russian doll and left it hollow, to serve as a nesting doll urn. From a photograph, our artist Anna Gavrilova created a beautiful, peaceful rendering of Connie. The matryoshka doll’s cloak depicts a nighttime winter scene. Our customer was quite pleased with the result and will remember his “living doll” each time he looks at the matryoshka urn. 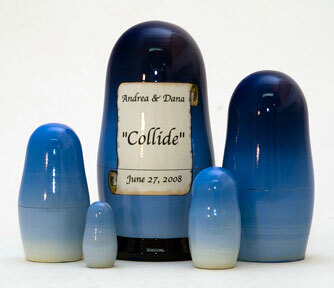 We can create a custom matryoshka urn for you too. We will strive to honor your loved one’s memory to your exact specifications. If you can dream it up, we can create it. The urn pictured above was 18” tall and cost $750. A smaller, less expensive urn can be produced as well. Feel free to contact us for a quote. Looking for a unique wedding favor? Let us help commemorate your special day with nesting dolls! We can customize the bride and groom, best man, and maid of honor to your specifications. We can even include your wedding colors, cake, names, and wedding date. Your guests will be thrilled with the collectible wedding nesting doll. Please allow two months for delivery if at all possible. 1st doll set: $175 for prototype development, (assuming only 2 people (bride and groom) need to be likened to their photo). This first doll must be purchased @ $175 for all projects. If only 1 doll set is needed, cost is $175 plus shipping. 100 units or more: $14.00 pc. Call us for a custom quote for exceptional designs or other quantities! 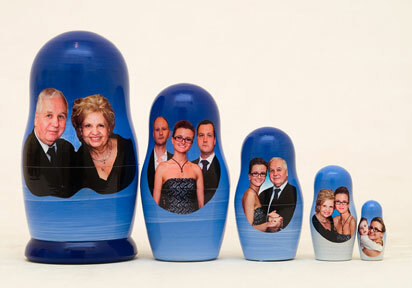 We can make a custom matryoshka to feature anything you like--even your favorite celebrity! 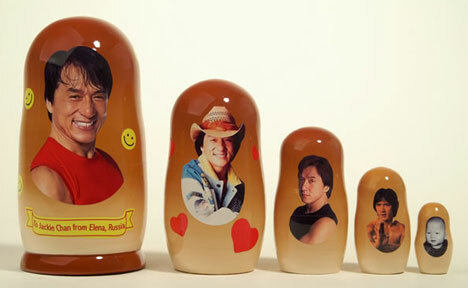 Elena had us create a custom nesting doll depicting actor Jackie Chan at various ages. She later met Chan at an event in China and gave him the doll as a gift. What is your favorite pastime? Fishing? Painting? Baking? Whatever your hobby, we would love to create a nesting doll for you! The matryoshka pictured above features an avid fisherman holding his prize catch. A personalized nesting doll makes a great and unique gift! 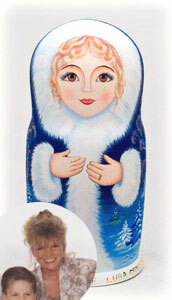 One of our St. Petersburg artists painted this nesting doll for a Russian history buff. 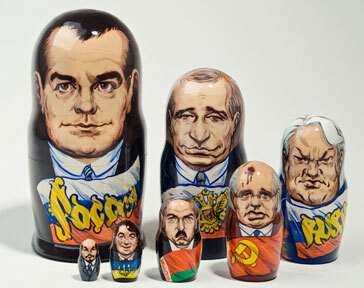 Depicted here are Medvedev, Putin, Yeltsin, Gorbachev, Lukashenko, Yuscshenko, and Lenin. She was quite pleased! Looking for a clever way to make an unforgettable statement in your next marketing campaign? Picture this: A wooden doll which opens, piece after piece like words in a sentence, to reveal a concept. Give it to your customer and the novelty of the collectible Russian doll will make a lasting impression, and be a keepsake. We have given countless companies a reason to smile, including Coca-Cola, John Deere, General Electric, Microsoft, and the Discovery Channel. We have also created promotional matryoshka nesting dolls for the movies Being John Malkovich and The Wild Thornberrys Movie. For more on custom promo items, click here. 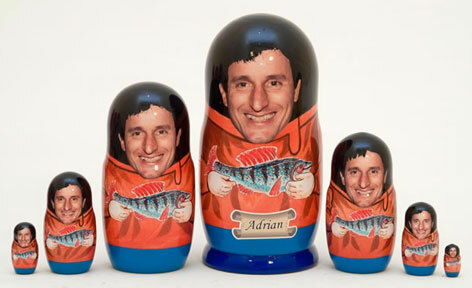 Dana gave this custom nesting doll to his wife Andrea as a gift for their first wedding anniversary. Each doll featured a photo from their big day. We added a banner to the back of the largest doll with their names, wedding date, and the name of their song ("Collide" by Howie Day). They were both pleased with the great memento!